The Cockburn Range near the Pentecost River. On the right, you can see our transport and campsite. The present blog is based very closely on one I wrote in September 2018 for my website Sharing Culture. Sharing Culture is an educational resource I developed in 2014 to help facilitate the healing of intergenerational, or historical, trauma. It was inspired by my reading of Judy Atkinson’s book Trauma Trails: Recreating Song Lines. 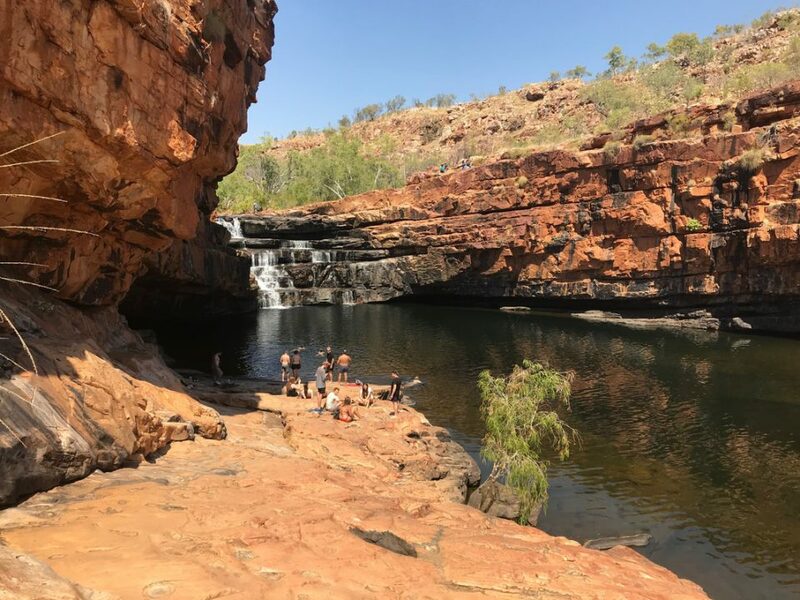 Last August, I travelled through part of the Kimberley, as part of a nine day Kimberley Adventure Tour from Darwin to Broome here in Australia. 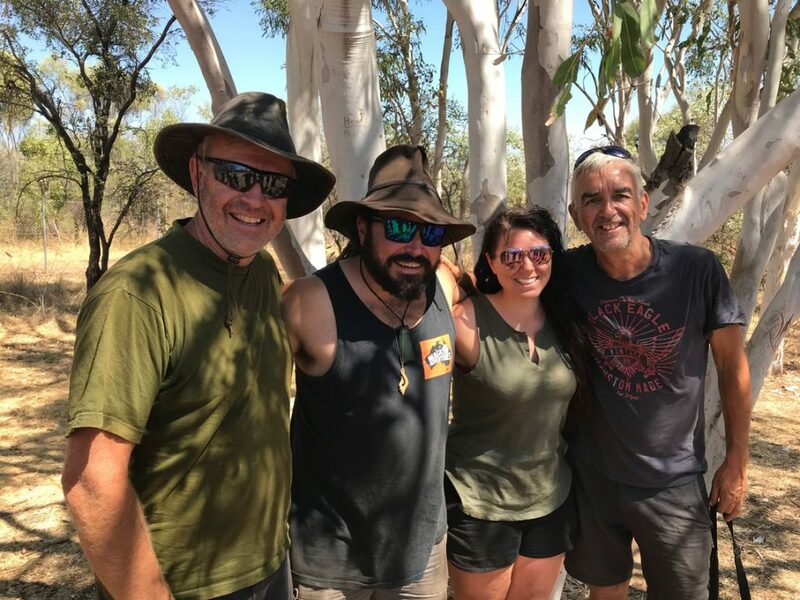 The trip was an Adventure of a Lifetime, shared with 12 other travellers, a travel guide (James Duffy, aka Duffman, 2nd from left) and driver Carlya Bell. We travelled in The Beast. One of those 12 co-travellers was best mate Erik Pileblad (left), a doctor from Sweden who I have known for 35 years. We worked together as neuroscientists with the late Arvid Carlsson, a Noel Laureate in Medicine, in Goteborg in the 1980s. Erik also felt this was a trip of a lifetime. He too fell in love with the Kimberley. 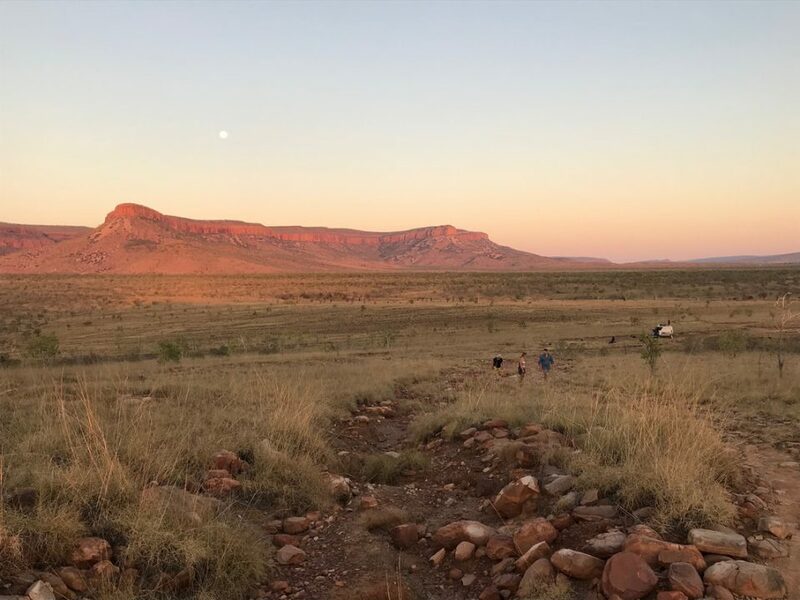 Whilst in the Kimberley, I experienced a peace I have not felt for a long time. Like many of us, I have experienced traumas which have impacted on my emotional wellbeing. I have struggled for periods of my life. The impact of ‘losing’ three of my children after a relationship breakup, and now living on the other side of the world to them has been enormous. At the same time, I am so lucky to be with my partner Linda here in Perth and to live the happy life with her that I do. However, the pain lurks in the background, the memories of past traumas surface from time to time. In the Kimberley, that emotional pain did not surface. I started to feel at peace with myself. And with my past. I loved every moment of our days, waking up to magical sights and sounds, and sharing the beauty of this magical Country with a great group of people. I began to realise the healing power of Country, something that I’ve known about, but not experienced in this way. My experiences made me reflect on how Aboriginal people are connected to their Country and how they treat it with the utmost respect. They know that this connection is central to their wellbeing and facilitates healing. Country is a living being. And it does have the power to heal. I know that now. I felt that healing power. The Kimberley touched me in a way I could not have imagined. I still feel those sights and sounds and the feelings I experienced. They still bring tears to my eyes. I also felt the healing power of social connection. The being with a group of special people, the sharing of experiences, the banter and the jokes, and the adventures we shared. The shared love of country. Connection is Healing. Thank you, fellow travellers. Thank you, Duffman, a multi-talented man with a big heart, and our lovely driver Carlya. But most of all, thank you Kimberley. I will never forget the peace you gave me. The Healing Power you possess. 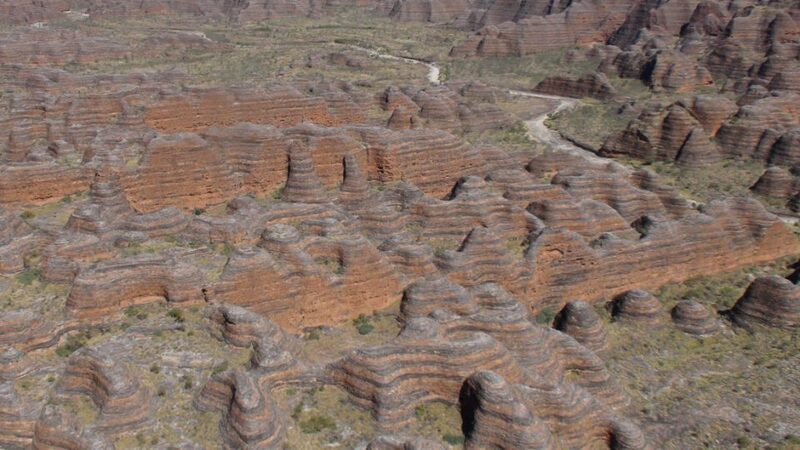 A helicopter view of the Bungle Bungle Range, located within Purnululu National Park.